To kick off my series on Eating Well on a Budget, I’m going to start off by showing you how to meal plan on a budget. The easiest way to do that is to show you as I do our meal planning for the week! 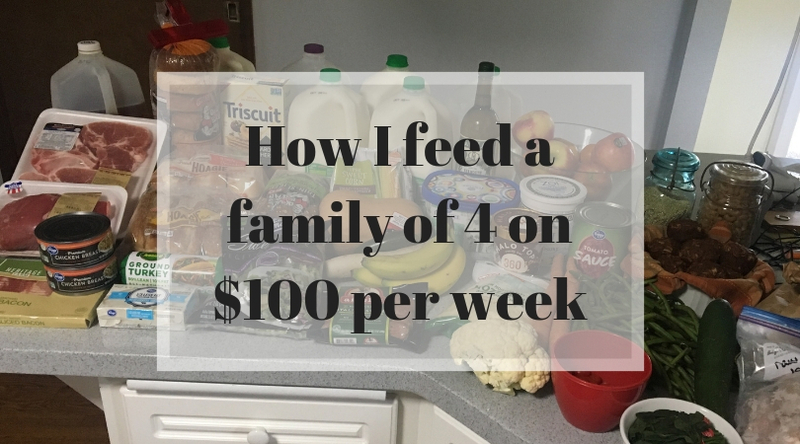 I’ve been feeding a family of 4 (2 adults and 2 currently 15- and 12-year-old boys) on an average budget of $100 per week for about 4 years now. At first, it was a struggle and required a lot of work, but after a few months it became much easier and now I would venture to say it’s second nature. Don’t feel like you have to incorporate every money-saving tip all at once. Add in one at a time. Every little bit helps, and taking it on all at once can be overwhelming. This does not include non-food household items (toilet paper, aluminum foil, hygiene products, etc) – we have a separate budget for those. Some of the things that help make this budget easier require a bit of advance planning (canning and freezing food in the summer, for example). At first, I only dabbled in these (and still stayed within budget – it just took more work to do so). I have a decent routine for these now and hope to add more (garden, here we come!) in the future. When you first start, it’s unlikely you will have these benefits right off the bat, so keep that in mind. It’s a little easier for me now for these reasons, but throughout the course of the next few weeks I’m going to teach you how to do all of the things I do to save money on food. Yes, we’re going to talk about canning! Previously, I did a post on how to meal plan (including a free printable template!). That is an excellent supplement to this article – in fact, you may want to start there, read through step 2, then come back here and continue on. This post will be a much more in-depth look at using your budget as a jumping point, as is mentioned in that article. 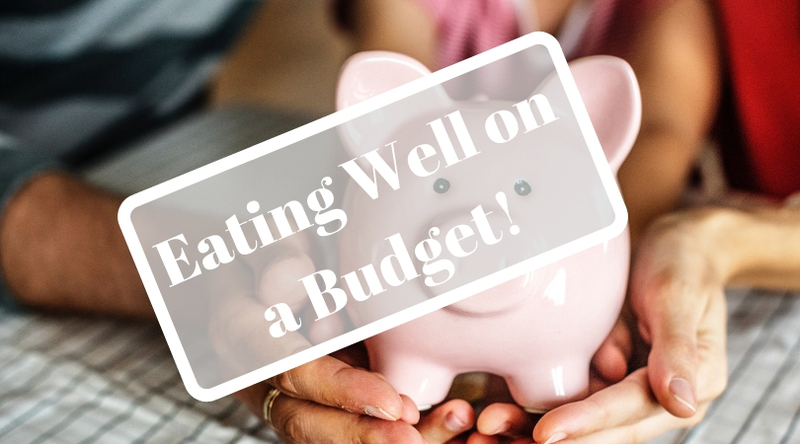 You can’t very well eat on a budget if you don’t know what your budget is! Decide how much you’re going to spend. For us, I tend to alternate between “stock-up weeks” where I go to Winco and buy regular groceries as well as bulk dry goods to top off our supplies, and “top-off weeks” where I fill in the gaps with produce/meat/whatever else we need. Winco is the cheapest option in our area, but it’s a bit farther away from us than some other stores, so my top-off weeks are sometimes done at a closer store like Fred Meyer. I spend more on stock-up weeks (typically about $120-125) and less on top-off weeks (about $75-80). This particular week is a top-off week, so this week’s budget will be $85. Look for food distribution programs in your area. I’m not referring to food banks or need-based programs (though please seek out those valuable resources if you need them), but rather food waste prevention programs. In my area, for example, there is a large warehouse where loads of nearly-expired food and produce collects every week. From there, people deliver it to different food distribution locations around the area. These programs are a win-win-win. Grocery stores have a place to send food they can no longer sell, landfills avoid thousands of pounds of food waste, and we get the benefit of free nutritious food! Search for food waste prevention programs online to see what might be available in your area. Since this food source is not predictable (some weeks there is a lot, and other weeks, nothing at all), I do my meal planning after I go, so I know what I will have. 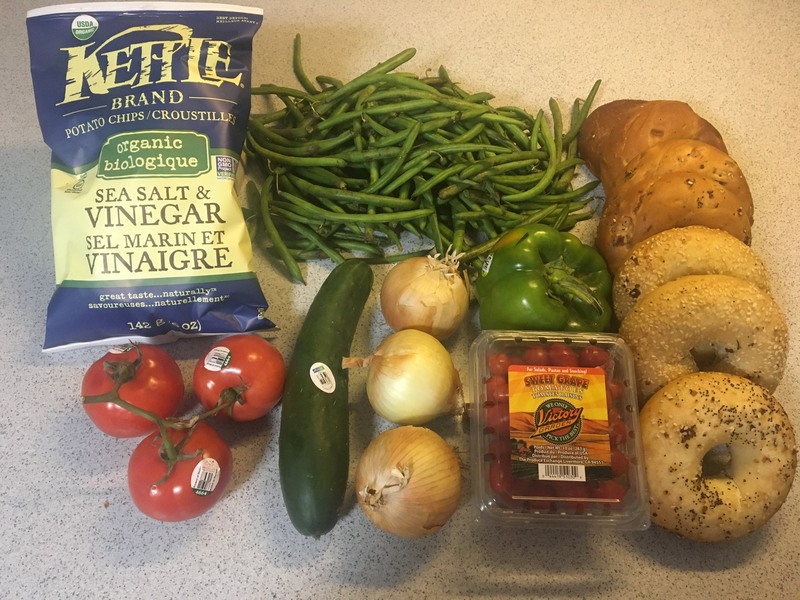 Here is this week’s food distribution haul – totally free! There was quite a bit available this week, so this will help my grocery budget a lot! Keep in mind though, this food is nearly expired, so you’ll want to plan to use it soon. Don’t dilly dally with this stuff – it’s on its way out! One of the greatest contributors to high grocery bills is buying duplicates of things we already have, then trashing wasted extras. You’ll notice that a lot of money-saving tips are also food waste-prevention tips because, well, food wasted = dollars wasted. I don’t usually write them all out like this, but for the sake of walking you through the process that happens in my head, here it is. Be aware that since this is a top-off week, I have more available than I will on stock-up weeks. I’ll be providing a lot more detail about this step in future posts, but for now I’ll run you through the basics. Either find a store that puts out a weekly ad, or a store that has killer prices all around (yay Winco!). If there’s a weekly ad, check for the best sales, especially on meat and produce, and make a list of those. What’s on sale and healthful is what you’re making! Use any coupons you have to create more good deals. Look at the list what you’ve got available and what’s a great deal at the store. What can you make with these? If you’re struggling to come up with ideas, use a search-by-ingredient database to help you find recipes. This week, we have several Mexican-type ingredients (tomatoes, cilantro, avocado, green pepper, onions) so I think I’ll make an enchilada quinoa casserole with those. My kids have been requesting mac and cheese (I have a recipe that uses an entire head of cauliflower and a butternut squash in the sauce!) so I’ll put that in there too. My husband loves Vietnamese steak sandwiches that use the cucumber I got from the food distribution, so I’ll include those. I’ll round out the week of dinners with pork chops and chicken parmesan. Go through your planned meals and add to your shopping list anything that you don’t already have and need to buy. I like to divide mine roughly by sections of the grocery store just to save time wandering. Include a rounded-up price estimate next to each item. 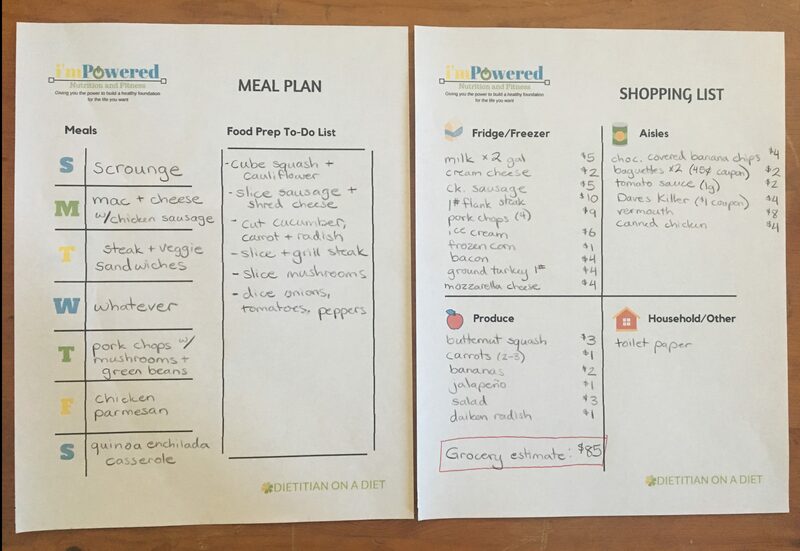 Click here for a copy of this shopping list/meal planning template. And to answer your question, no…my grocery list is never this neat. I used my best penmanship and avoided using too much of my made-up shorthand for your sake. You’re welcome. 🙂 Also, if you’re wondering what “scrounge” and “whatever” are all about – they can seriously help decrease your food costs and waste! Click here to read more about those. Quickly tally your estimated prices to make sure you’ll be within your budget. If not, drop off unnecessary ingredients (garnishes, extra snacks/desserts, etc) until your estimate is within your budget. You’ll notice that there are a few ingredients on my list that are not particularly “low cost” items, like flank steak, Dave’s Killer Bread, and vermouth for my pork chop recipe. Regardless, we want to eat these and my estimate is still at budget. If I cut those or swapped them for cheaper alternatives, I could bring the cost down even further! Take your budget-conscious shopping list to the store and get the goods! If my estimate is very close to my budget, I like to keep a quick, rounded-up tally on the calculator on my phone as I put items in my cart to avoid overspending. If I have a bit of a buffer, I don’t bother with this. You’ll notice that I underestimated the costs of some things (hello, $13 PER POUND flank steak! Sheesh! ), but rounding up on my estimates usually gives me some wiggle room. So here’s my haul and the receipt for it – I spent $81.06 on all of my “top-off” items. 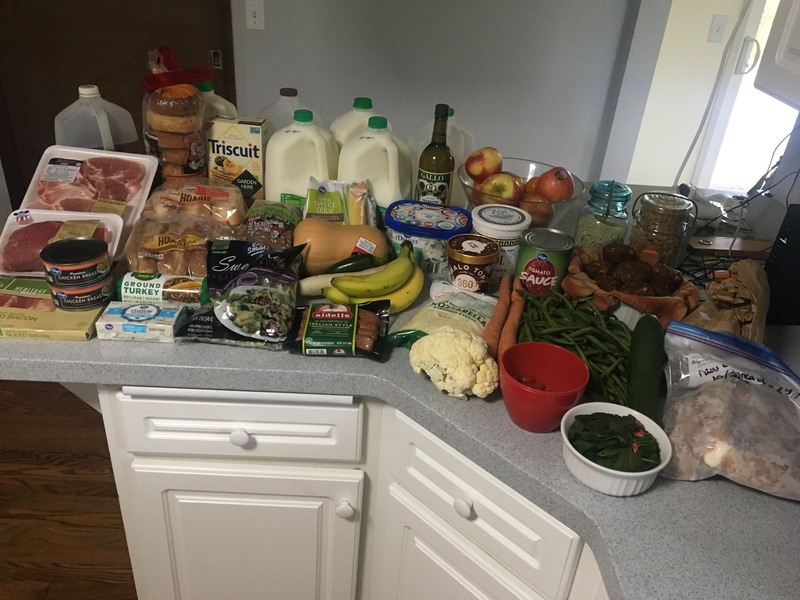 Combined with (most of) the ingredients I had from food distribution and my pantry/refrigerator, here’s a look at our food for the entire week. Even if it seems overwhelming at first, this process gets easier with more practice. Now it only takes me 10-15 minutes to make my meal plan and stay in budget. Plus, we eat healthful, tasty food – all for an average of $100 per week! Thanks for reading! Stay tuned for more tips on eating well on a budget – I have a lot of exciting posts planned to share with you! 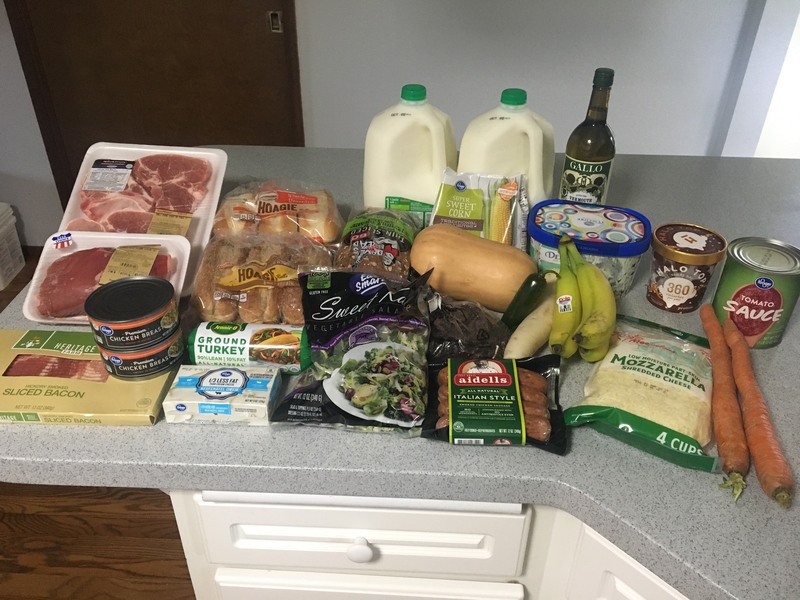 I walk you through a stock-up week in this post, so click there to see what my other weeks look like. Comment below with your favorite ways to keep grocery costs down! Over the next three weeks, I will share with you the nitty-gritty of our food budget, along with every tip I’ve got for making healthy eating affordable. Stay tuned for more info on budget-friendly eating! 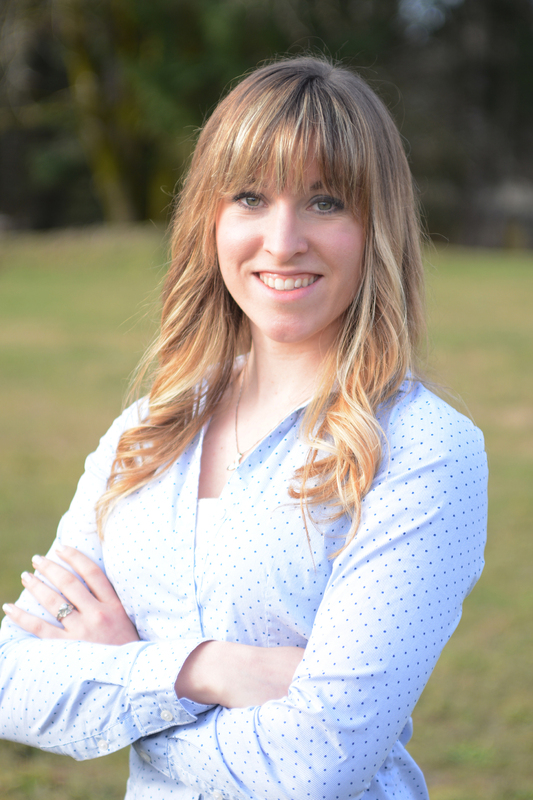 Congratulations to Kristin for winning our tiebreaker giveaway! I hope you love your new quick slice! 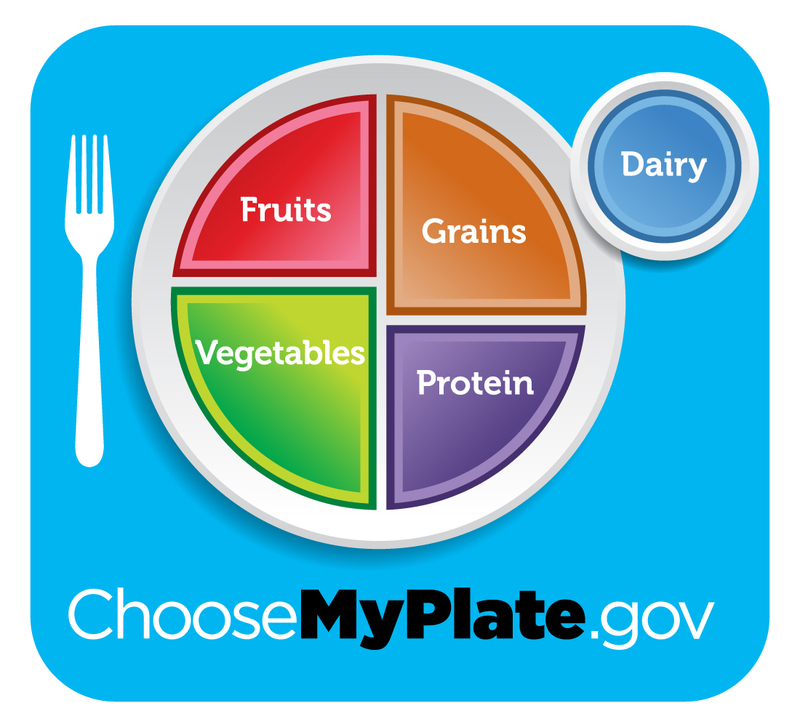 In this series, we’ve covered several tips that can help make eating well simpler and easier. From meal planning to food prep, these strategies can help you make the most of your time. 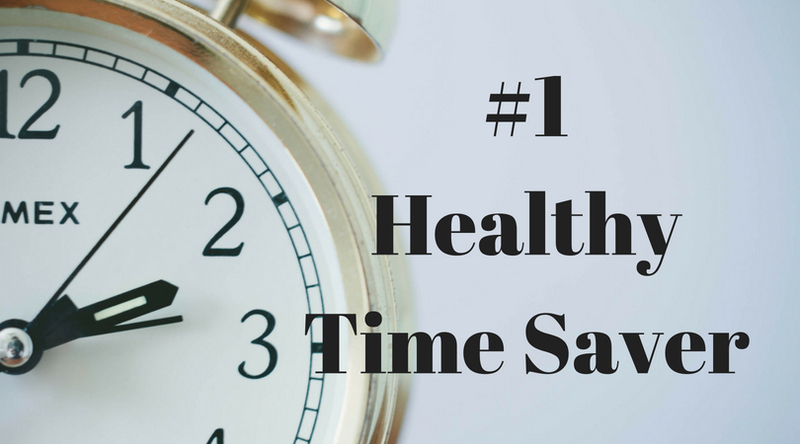 There is one more thing that is absolutely vital to finding the most efficient, time-saving way to be healthy. Without this, you may be able to bumble along, finding some success along the way, but never truly be healthy or happy, and certainly not save yourself any time. When I work with clients, I always try to help them find skills and strategies that are sustainable for them in the long term. By long term I mean lifelong (or at least until a major life change comes along). To do that, we test changes one at a time to make sure that they actually fit that client’s life/personality/budget/preferences/family/etc. I encourage clients not to commit to new health changes right off the bat – don’t get married, date first! There are several ways to approach being healthy, just as there are many fish in the sea. Don’t just find any old fish and marry it! It might be smelly or taste too fishy or its scales may clash with your décor. You have to get to know it first and spend time with it in a lot of different situations before you know if that fish is the fish for you. If it’s not, toss it back and find another. This process of trial-and-error is key to your long-term success. You might be right, in the short term. Complete ready-made plans are very appealing. You don’t have to think about them – just follow the meal plans they give you and it will seem so, so simple. You’ll start moving toward your goals and feeling well. You can fight, claw, and scratch for weeks, months, or sometimes even years. But then…the meal plans get boring or expensive, you get tired of making yourself different food than your family, or you just want a single darn slice of bread! Following restrictive plans designed by strangers (who didn’t have you in mind) only works for so long. You can not succeed forever with a cookie-cutter plan. You must test drive individual changes to see how well they fit all of the factors that make up your individual life. Date them. Don’t get married blind! It certainly can be, and I won’t sugar-coat that. 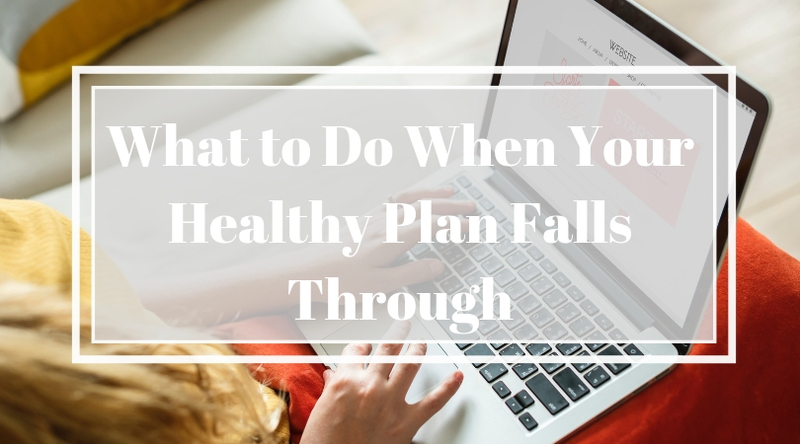 But I can promise you that in the long run, it is a straighter line to lifelong health, happiness, and weight maintenance than using diet plans that you can’t (and shouldn’t!) continue forever. The effects of these diets on your metabolism and your mindset can create a physiological cycle that works against you for the rest of your life. Unsustainable restrictive diets are training your body to store fat,1 and training you that being healthy is a miserable process. I can’t even begin to count the clients that I’ve seen who are chronically undereating (a sad lesson taught by a myriad of ill-fated diet plans) and have lost x numbers of pounds and gained x + 20 over and over again throughout their lives. So how does fiddling around with these diet plans save you time in the long run? Resist the temptation for a “quick fix.” Daily at my practice I see the results of years and years of “quick fixes” that never actually fixed anything in the long run. It takes work to heal their metabolisms and get them on a healthy, realistic track. One of my clients spent years exercising and following a low-carb diet (that he despised, by the way). It is taking months of proper eating to get his metabolism convinced that it’s safe to lose his 80+ pounds of extra body fat. I am certain that he would not say that his time on that diet saved him any time in the long run. Stay away from restrictive diets. Test out individual, realistic, and sustainable changes that work for you. If you need help finding realistic changes to make, stay tuned! I’ll be posting tips about finding changes to test drive that are most likely to work with different personality types. 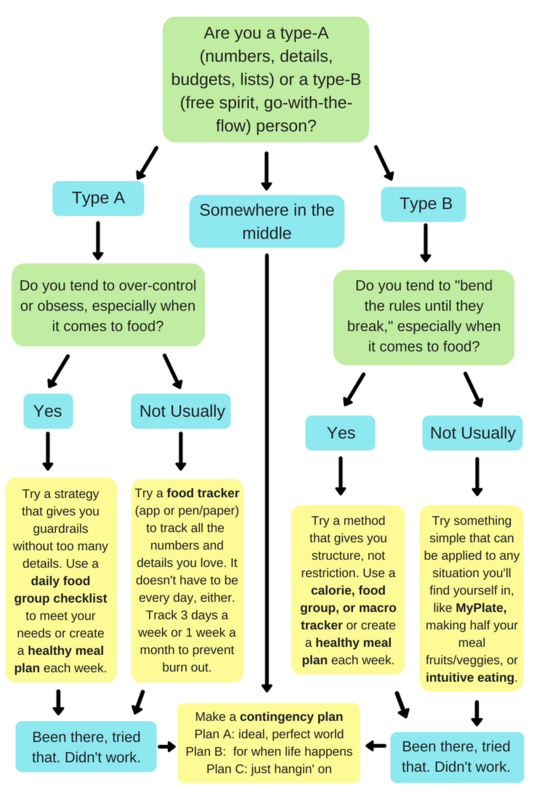 If you’re still overwhelmed, find a dietitian to help guide you through the process! It’s what we’re here for. Don’t waste your time with tantalizing promises of quick weight loss that are ultimately followed by disappointing regain and a messed-up metabolism. Invest your time now in a life that is much healthier and much happier down the road. It can save you years – and that is quite a lot of time, don’t you think? Cooper, E. The Metabolic Storm: The science of your metabolism and how its making you fat. Seattle Performance Medicine. 2015. 2nd edition. Lowe, M., et al. “Dieting and restrained eating as prospective predictors of weight gain.” Front. Psychol. Sept 2013. Accessed August 12, 2018. https://www.frontiersin.org/articles/10.3389/fpsyg.2013.00577/full. When it comes to eating well, the general school of thought is that you “should” make everything that goes down the hatch from scratch. Not necessarily! Convenience foods can have their place in a healthy lifestyle. 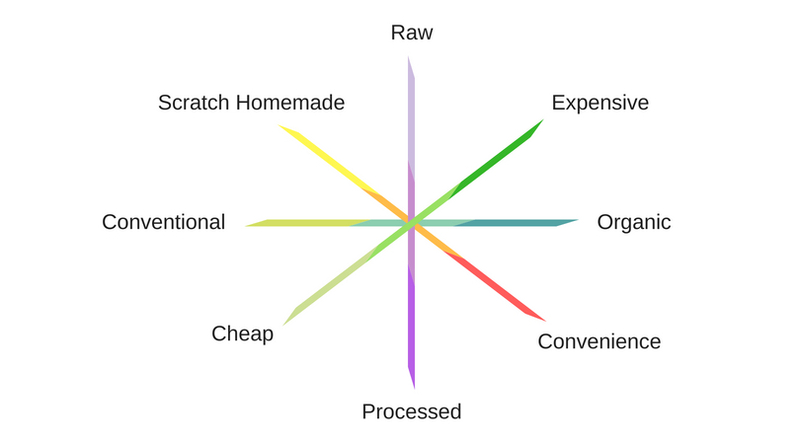 Eating healthfully is a spectrum…a multi-faceted, complex, and very personalized spectrum. It’s important that you find a place in the midst of all these factors that works with your lifestyle, not against it. If you want to eat entirely home-cooked-from-scratch but you’re a single parent with 2 jobs and 3 kids, it might be a challenge to bake your own bread every week. It’s important that your food choices fit well with your entire life, and remember that it’s not all-or-nothing. Have you ever felt like it’s not worth trying to be healthy if you can’t “eat clean” 100% of the time? That’s bogus. Sometimes you sacrifice a little nutrition for sanity. If the alternative is doing nothing, then doing something is definitely a better option! Also remember that your place on the spectrum is a fluid concept that can change from month to month or even day to day. If life happens and pushes you towards processed for a few days or a week, it’s not the end of the world! Hang in there and keep doing the best you can. When things calm down, you can head back in the direction you want to go. 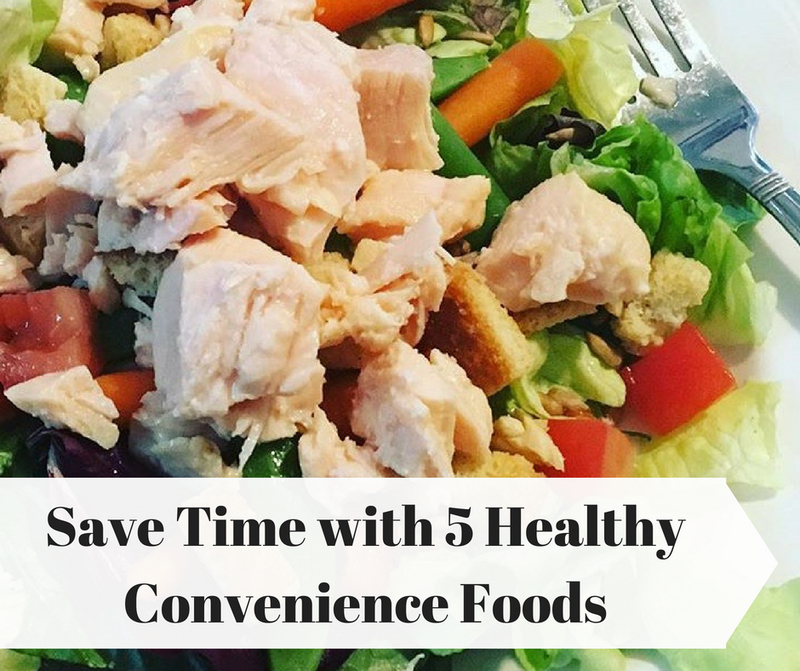 In the meantime, whether you’re very busy every day, extra-stressed for a few days, or your entire life is just a whirlwind, having healthy convenience options can make eating well much, much quicker. Here are a few of the most useful, versatile, and cost-effective convenience foods. 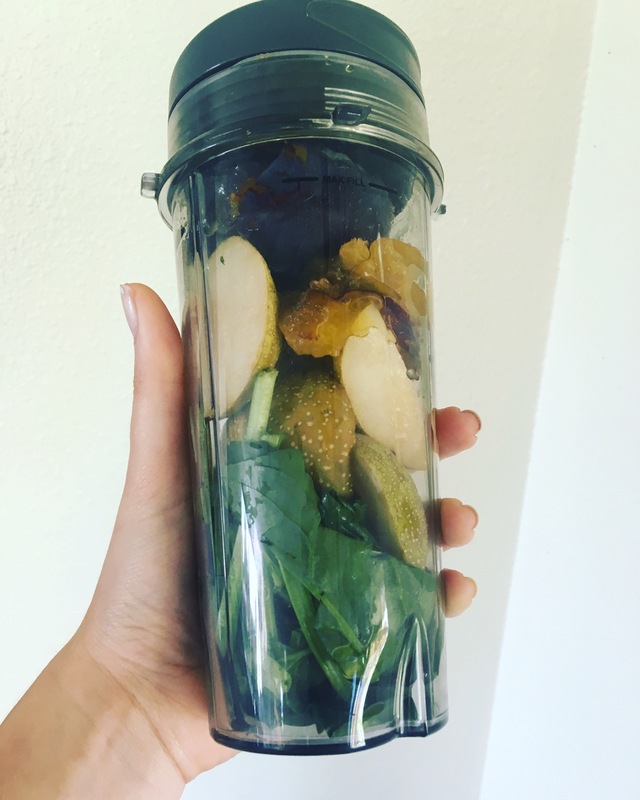 Eating healthful proteins can be one of the most challenging areas to maintain when you’re busy since many proteins need preparation (not to mention all those times you forget to take something out to thaw, darn it…that’s not just me is it?). Prepared proteins can be just the ticket to ease this burden. Into this category fall canned meats like chicken, tuna, and salmon, canned beans, and frozen pre-cooked meats or meat alternatives. Cans of meats or beans can be tossed in with a salad, eaten with some whole grain crackers, dumped onto nachos, or mixed in with pasta, rice, or a casserole. Since they are all already cooked, just dump and mix! Several brands have begun making pre-made chopped salads complete with dried fruit, dressing, sliced nuts, or other toppings. Most have a delicious Asian sesame version, fruit-and-soft cheese version, and more. The flavors are delicious and these salads certainly are convenient. If you’re unlikely to make a salad on your own or are tired of your lettuce getting slimy because you never get around to chopping it up, these can be a lifesaver! Use them as a side dish or top them with a prepared protein and add a piece of fruit for a complete meal. These versatile beauties are great to have around for any time you haven’t had a chance to meal plan. With a few spices, they can quickly turn into a pasta sauce, chili base, or pizza sauce on a pita or tortilla pizza. Try to find a “No Salt Added” version to reduce the added sodium – then you have control over the salt that is added. Check out my recipe for a 5-minute Heart Healthy Pizza/Pasta sauce using canned tomato sauce! So many of my clients tell me that their biggest challenge with eating healthy food is that preparing vegetables can be so time-consuming! Washing, peeling, chopping, and cooking vegetables is just enough work that it discourages them from actually eating vegetables! For days when you didn’t get to your food prep and you just don’t have the time to take those veggies from whole to roasted, a bag of frozen veggies can be such a lifesaver! These come individually (think frozen broccoli, carrots, or peas) or in pre-made combos like stir-fry blends, California blend (broccoli, cauliflower, carrots), and Normandy blend (zucchini, carrots, yellow squash, broccoli, and cauliflower). Keep a few of these in your freezer and have a veggie side dish in 2-3 minutes with no prep at all. 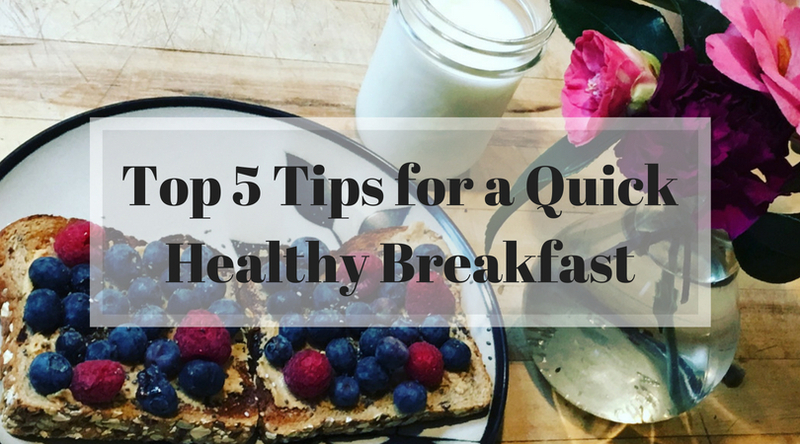 When your morning doesn’t allow for the process of simmering steel-cut oats, quick oats can get you a dose of whole grains in a flash. Microwave them with water for a minute or pour boiling water over them. Mix with some fresh fruit, a scoop of peanut butter, and a couple teaspoons of brown sugar or stevia and you are good to go! Homemade instant oats contain less sugar, more fiber, and more nutrition than the instant packets and take the same amount of time. What are the go-to convenience foods that help you maintain a healthy lifestyle?